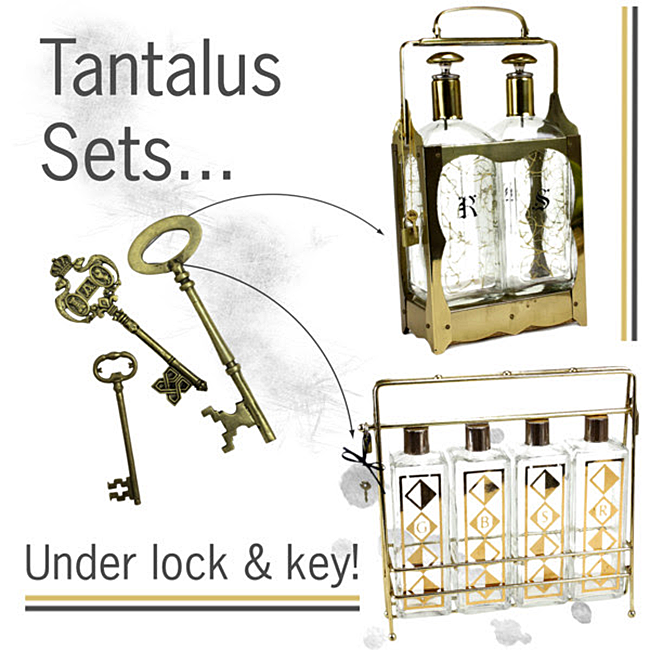 Vintage Tantalus Sets: Keep Your Spirits Under Lock & Key! Tantalus. What in the world is that? The tantalus is a late-19th century introduction to keeping your liquor under lock and key. Liquor stored in decanter bottles was kept safe by the locking tantalus frame that held decanter bottles inside. 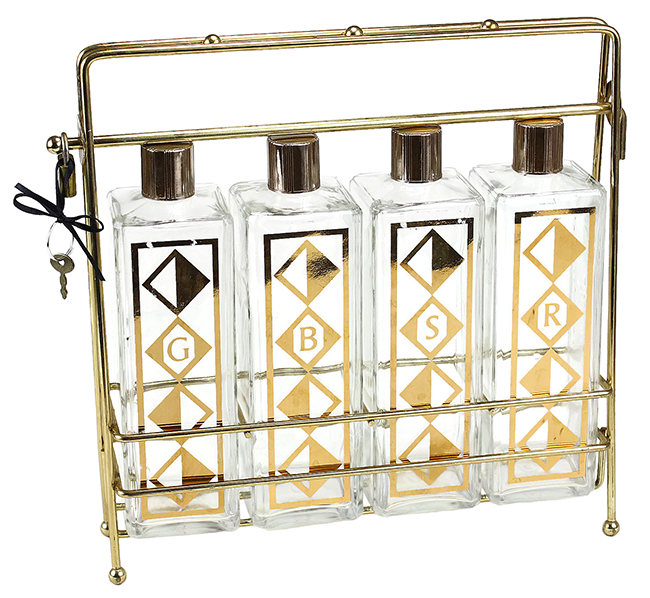 The frame was designed in such a way that while it was an open caddy for displaying elegant decanters, it also locked so the decanters and their stoppers could not be removed without the key! Did you know that until the licensing act of 1860, spirits and wines were not sold in their own bottle? No, they were sold straight from the barrel, which meant if you wanted to buy alcohol, you also needed to take along a container to be filled. Until the first decanter was produced in the 1690s, a claret jug was typically used. The first patented tantalus was in 1881 by George Betjemann, a cabinet maker from the Netherlands. However, the first tantalus prototype was introduced in Stourbridge in 1860 and was made of wood. There are differences of opinion as to why the tantalus was ever made, but the fun version is they were designed to protect the bottled goodness from the servants sneaking a few sips! As a result you will also hear a tantalus referred to as ‘The Butler’s Enemy’! The tantalus solved two problems. With an increasing consumption of spirits in the home, it was one way to keep the alcohol from being pilfered, and at the same time allowed the showy decanters to remain on display, an important consideration for the Joneses of the day! You will find a range of tantalus options and designs for holding 2 decanters, 3 decanters and sometimes even 4. You will also discover the tantalus design was adapted to accommodate other things: cigar boxes, fountain pens, perfume bottles and even tea in tins! Let’s take a peek at a few options you might have seen at Audrey Would! Both are from the 1950s and are complete with lock and key. Our 2-decanter tantalus is quite unique with a wind up musical feature that plays, ‘How Dry Am I’ when one or both bottles are removed! How much fun is that? If you are looking for a unique gift for Dad with historical roots, we think a tantalus is a great way to go! Buy the 2-decanter tantalus here. 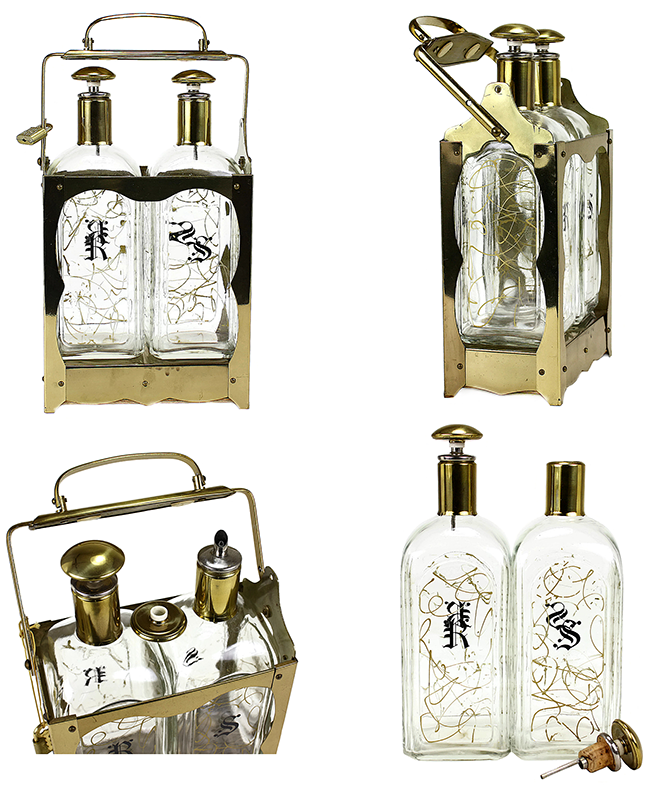 The 4-decanter tantalus was available, but has recently SOLD! Once you read them, you decide. Was the tantalus designed to keep the servants from pilfering, or was it simply a novelty item meant to be enjoyed by the rising affluent middle class of the time? Photographs by Sheila Zeller for Audrey Would! Please link and credit if you choose to use. That’s really interesting! I always learn something new on your blog! Thank you so much Heather! I appreciate it very much. Well I don’t think I’ve ever seen a tantalus before, that’s very cool! I guess nowadays we just lock up the whole cabinet – is that because we have more booze around?? 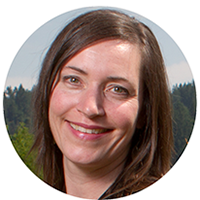 Thank you for taking the time to pop over and for pinning! I appreciate it very much!! I had no idea such an item for securing spirits ever existed (besides locking up the liquor cabinet). I love learning new things! I also love that your alcohol can be left out safely and look like a decorative piece. I wonder how many other people know about this? Ha! The butler then, teenagers now! Love it!! Next PostNext A Vintage Home With A Vintage View!